Welcome to Security For Less online store! The RF Label or 4 x 4 RF label, also known as RF labels or EAS labels are packed 1000 labels per roll and 20,00 labels per carton, these are white with a dummy barcode printed on the top face and an adhesive back for application onto packaged goods. The RF label is detected at the door by the RF EAS tagging system if it has not been deactivated at the sales counter by an RF label deactivator. These RF security labels require an RF Label Deactivator to deactivate labels at the counter. 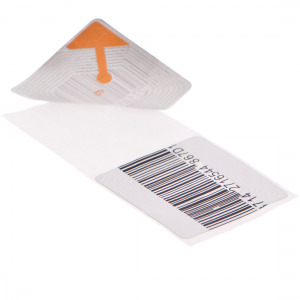 Available in two popular main sizes 4cm x 4cm (4x4) and 5cm x 5cm (5x5), the larger the label the better the detection by the security tagging system. © Security For Less Store. All Rights Reserved.